If you’re looking for a highly customizable countertop material, look no further. Concrete is incredibly versatile and offers many design options. From traditional styles with ornate edge details to sleek counters with a polished surface, concrete can be used to achieve anything imaginable. Explore the information below to discover what design options suit your taste. Kitchen Countertops See how concrete can be used to make a bold statement in kitchens. Bar Counters Discover the benefits of using concrete for bar counters. 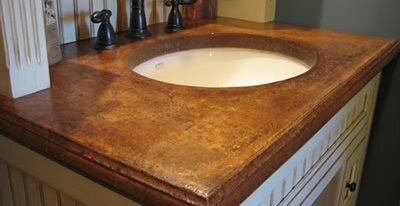 Bathroom Countertops Learn about using concrete in the bathroom for sinks and vanity countertops. Outdoor Concrete Countertops Design ideas for creating an appealing outdoor kitchen retreat. Restaurant and Bar Countertops Get design ideas for using concrete countertops in restaurants and bars. Concrete Countertop Colors Find out what colors are available, how to get samples and get design ideas. Modern Concrete Countertops See how concrete can be used to make a bold statement in modern kitchens and restaurants. Sustainable Concrete Countertops Find out why concrete is one of the greenest countertop materials you can use. Concrete Countertop Finish Options Compare marbleized, wood-grained, hand troweled, polished & exposed aggregate finishes. Edge Details Discover how adding an edge detail can help customize a concrete countertop. Embeds & Inlays Personalize a concrete countertop in a kitchen, bathroom, or even outside with inserts or inlays. Drainboards and Trivets Learn how integral drainboards and trivets can add style and function to a concrete countertop. Backsplashes See examples and get inspiration for concrete countertop backsplashes. Fiber Optics Learn how to add magic to cast concrete counters with fiber-optic lighting. Personalized Countertops See examples of what's possible when you let your imagination run wild. Get design tips from Fu-Tung Cheng concerning how to personalize countertops. Hear Fu-Tung Cheng explain his design process and learn how to make countertops. Concrete Tables, Floors, and Sinks Are Perfect Ingredients for a Pizza Parlor Stan Squires, Table Mountain Creative Concrete, Golden, Colo.